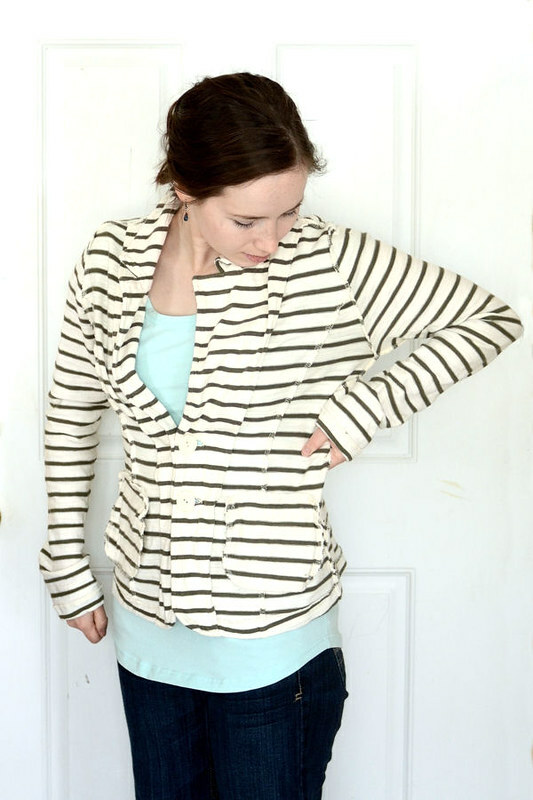 In case you guys didn't know, I'm in love with thredUP. It's basically an online thrift store. I love scoring designer pieces for a fraction of the retail price. One of the problems with buying anything online is the risk of getting the right fit. I'm sure this jacket was meant to fit a little looser, but I prefer a more snug fit since I'm on the shorter side (5'2") and I don't want to be swallowed by my clothing. 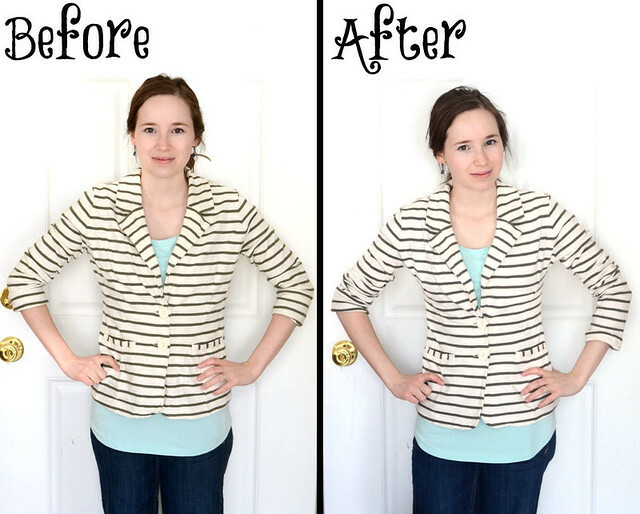 It's super easy to take in a knit jacket or shirt. Let me show you how! Start by putting your shirt on inside out. 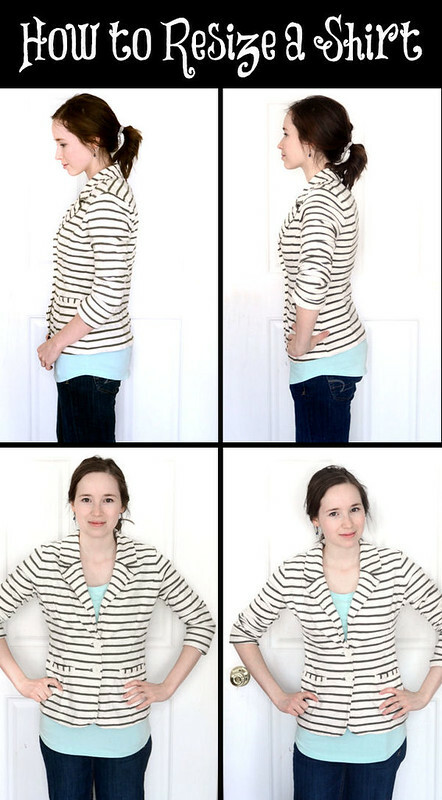 Grab the excess fabric with your hands and place pins all along the sides of the shirt. 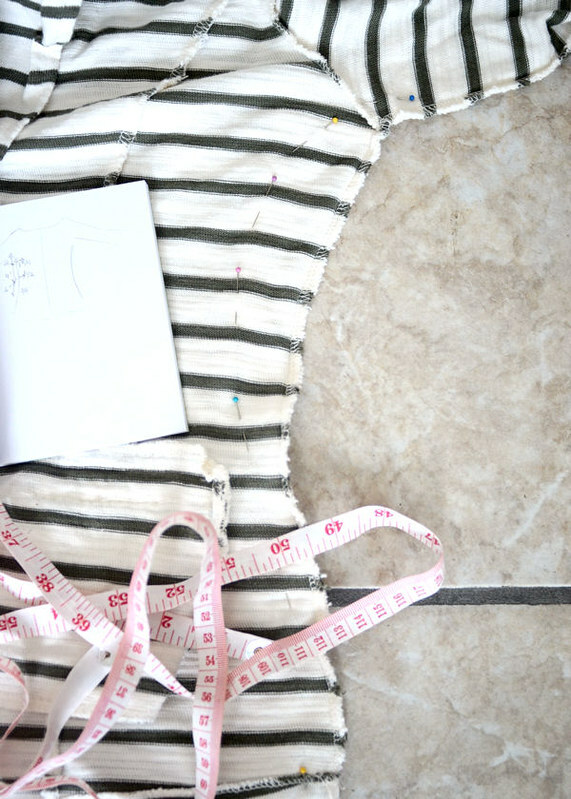 Carefully take off your shirt and lay it out on the floor or (if you're super cool) your work table. Measure how much you need to take in at different points on the shirt and write it down (for example, at 3 inches from the armpit, how much do you need to take it in? How about at 5 inches, etc.?). I find it helpful to draw a diagram. Remove the pins, make sure the shirt is laying flat and even, and replace the pins at the measurements that you wrote down. You can also draw a line along the pins to help you sew evenly. Sew along the pins, removing as you go. Try on the shirt to make sure you like the fit. 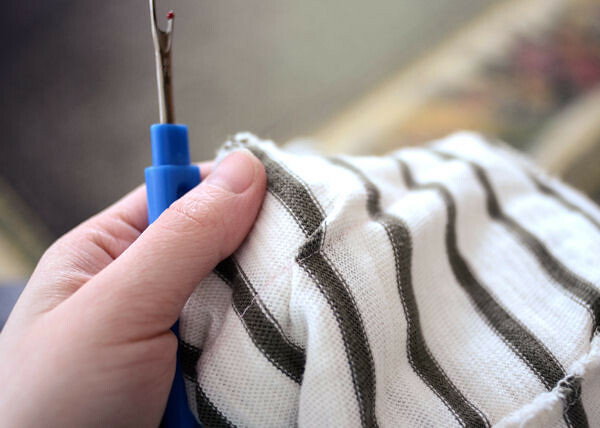 Don't worry if you make a mistake - your seam ripper is your friend! 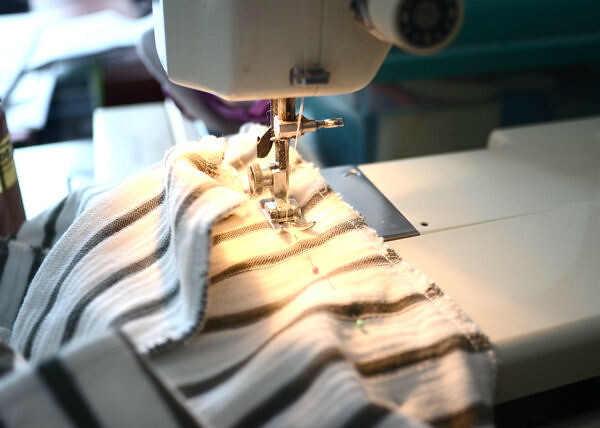 Simply pick out the stitches around the mistake, rearrange the fabric so it lays flat, and sew up the hole, making sure to sew back and forth a couple times and the beginning and end to makes sure it doesn't come undone. If you're really particular you can iron your seam open, but I'm too lazy for that. I pull out my iron maybe once or twice a year. If everything is good to go, sew another line close to the one you already sewed, this time on the outer edge. If you have a serger you don't need to do this, but I like to sew another line to keep the edges from fraying. 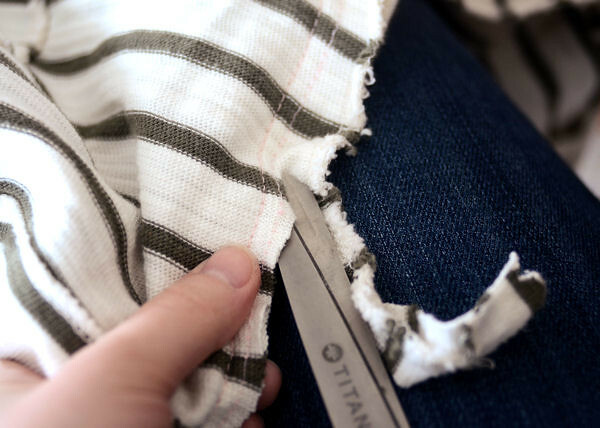 Cut the excess fabric close to the sewing line. And there you have it: a nicely fitting jacket. 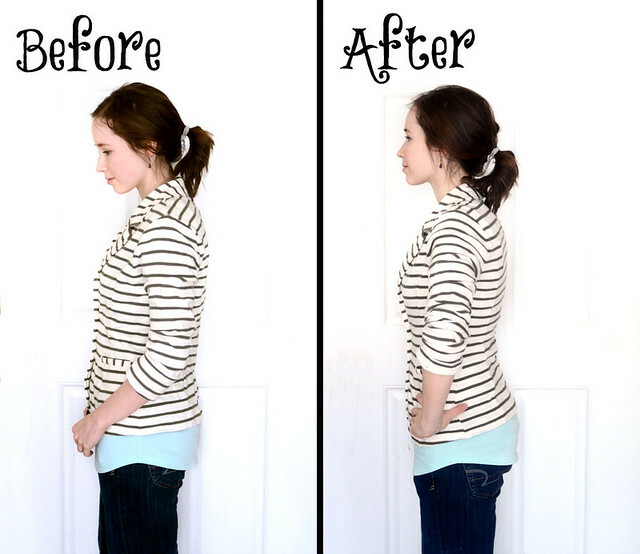 I also used this method to resize a nursing shirt. Here's the before and after. Helen decided to photobomb my before picture. 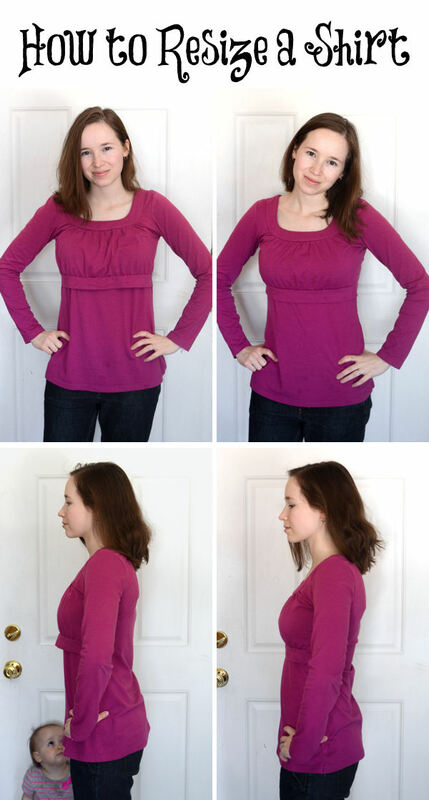 Make sure to send me pictures if you use my method to resize your shirt. And leave me a comment if you have any questions. Erica, this is really helpful!!! I am definitely going to give this a shot. First, of course, I need to learn how to use my sewing machine. Do you find it easy to use the sewing machine on jersey (stretchy fabrics) vs. cotton no stretchy fabric? For some reason it intimidates me. I will definitely post an update if I try this! And, Helen photobombing is really cute!!! Ugh, sewing machines can be so intimidating - they'll be working fine one minute and acting up the next. And I have no clue why! I'm real encouraging, aren't I? I don't find that jersey is super hard to work with. You have to be careful not to stretch it too much while you're sewing. But other than that it's pretty forgiving. You probably want to make sure you're using the right needle and thread for jersey as well. Wearing it inside out to measure is a great idea...I've done this before but usually just guess the inches I need to take off instead of actually trying it on and pinning like that. I need to hit up Goodwill again soon! My main issue is a really long torso (short overall with short legs) so I usually find shirts to be too short for me. Maybe I should come up with some creative lengthening options. This is an awesome tutorial!!! Definitely going to try this soon!! Looks awesome! I want to try it with my denim jacket... do you think it will work the same? I don't see why it shouldn't work! Although the heavier denim fabric might be more challenging to work with than a lighter cloth. 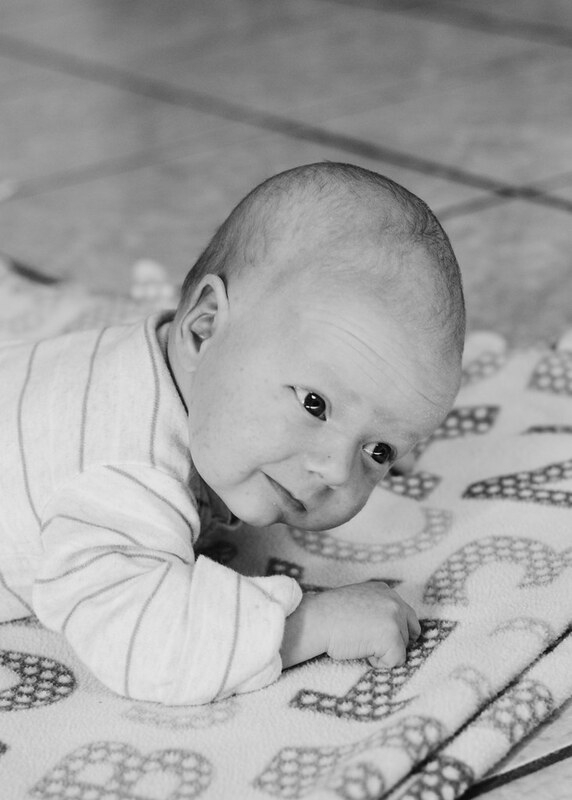 You may want to make sure to sew gradual lines, and iron the finished product very well. :) Good luck! What is the purpose of taking out the original pins, measuring, and putting them back in?